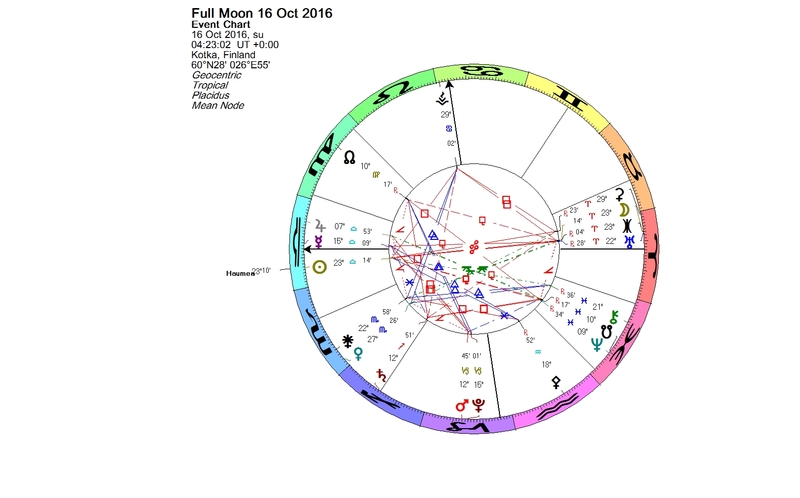 This is the Full Moon when unexpected events can be expected. The Moon at 23+ degrees of Aries fell tightly on the Uranus-Eris conjunction. In the opposing sign, Libra, the Sun was in exact conjunction with Haumea, one of the dwarf planets. Haumea and Eris are forming a long ongoing opposition between the years 2014 and 2018. Because of the phenomenon called retrogradation, these planets make the total of nine exact oppositions to another during these years. The middlemost of these aspects happened on Oct. 13th. Eris is the most massive and second-largest dwarf planet known in the Solar System. It is a scattered-disk object. It was discovered in 2005 and first known as Xena (after the Warrior Princess in a television series), which was a nickname given by the discovery team. Eris caused Pluto’s astronomical demotion. Eris was officially named in 2006 after the Greek goddess of strife and discord. The previous time that Uranus and Eris were forming a conjunction, was in 1927 and 1928. The conjunction took place at the Aries Point. Because both planets are moving slowly, the conjunction was valid longer than just two years. The Aries Point is a point which connects the individual with the larger world and is associated with fame. I have two examples of people born with that conjunction. The Queen of Suspense, Mary Higgins Cark, was born on Christmas Eve 1927. Her Sun is at 1+ degrees of Capricorn, tightly squaring the Uranus-Eris conjunction at the Aries Point. Also Jupiter in late Pisces was conjunct Uranus and Eris. The time for Higgins Clark’s birth is not known, but there was a New Moon and a Partial Solar Eclipse at 1+ degrees of Capricorn on that same day. So her Moon can be included in the square configuration. Mary Higgins Clark began writing at an early age. Despite of her advanced age, she continues writing. She has over 50 novels published, and all of her suspense novels have been best-sellers. She also has won many awards for her writing. In her birth chart Mercury (writing) is squaring Jupiter (expansion). Her Sun and Mercury are in a flowing trine to her Neptune in the last degree of Leo (inspiration, imagination), and Neptune is also aspecting the Uranus-Eris conjunction at the Aries Point. Higgins Clark is said to have the ability to slowly draw out the tension while making the reader think everyone is guilty. Her novels feature strong, independent young women who find themselves in the midst of a problem that they must solve with their own courage and intelligence (Eris). Many of the books deal with crimes involving children or with telepathy. In my bookshelf I have several of her novels, which I have not finished reading – they are just too creepy for me. Yayoi Kusama (born March 22, 1929, time unknown) is a Japanese artist and writer. Her exact Sun-Eris conjunction at the Aries Point, and the opposition of Mars and Saturn from Cancer to Capricorn, form a t-square. Uranus is in conjunction with Eris. There have been tragic twists in Yayoi Kusama’s life, and although in her birth chart there are many other clues from which you are able to read the story, Eris plays an important role in her life and art. Kusama started creating art at an early age. She became interested in the European and American avant-garde, and in 1957 she moved to the United States. The polka dots have become a trademark of her work. She covers surfaces with the polka dots, or “infinity nets,” as she calls them, taken directly from her hallucinations and obsessions. While living in the US, Kusama was hospitalized regularly from overwork (Eris as cast out from society). She returned to Japan in ill health, and in 1977 checked herself into a hospital for the mentally ill in Tokyo. She has been living at the hospital since, by her own choice. She has continued her work. She is one of the leading artists in the world today, and she has received numerous awards. Yayoi Kusama has been described as a conceptual artist, a minimalist, a surrealist, a pop artist and a feminist artist. Kusama’s art is not a bit gloomy, although she has fought against the darkness of her mind during her whole life. Its central themes are infinity, repetition and the desire to become one with the world. The viewer can become part of her imaginary world. 136108 Haumea is a dwarf planet discovered in 2004 by Mike Brown and his team. In 2005 they discovered that Haumea has two moons, which were later named as Hi’iaka and Namaka. The names come from the Hawaiian mythology, where Haumea is the goddess of childbirth and fertility, and Hi’iaka and Namaka are two of her children. Haumea is the second Kuiper belt object after Pluto known to have more than one moon. In mythology Haumea’s many children sprang from different parts of her body. She can take many different forms and has experienced many different rebirths. Hi’iaka was born from the mouth of Haumea. She danced the first Hula on the shores of Puna and is the patron goddess of the island of Hawaii and of hula dancers. Namaka is a water spirit, who was born from the body of Haumea. When Pele sends her burning lava into the sea, Namaka cools the lava to become new land. 136108 Haumea is one of the strangest objects in the Solar System. It is one of the largest trans-Neptunian objects discovered. In the very distant past another object probably slammed into Haumea at high speed, and this giant impact led to all of its odd properties. It is the fastest rotating body and also the most bizarrely shaped body of its size class. The rotation period is only about four hours. The shape of Haumea is therefore stretched out and resembles an American football. The rotation time is near the point where body of this size starts to break down. Haumea is followed in its orbit around the Sun by a swarm of icy bodies that were originally ejected from the surface of Haumea during the giant impact. They are called the Haumea family. Perhaps in the future these bodies will be named after other mythical children of Haumea. Before the official naming the discoverers of Haumea nicknamed it “Santa”, because they had discovered it on December 28, 2004, just after Christmas. Two original artists born with their Sun conjunct Haumea are the awarded singer Amy Winehouse and the high-wire artist Philippe Petit. Both have walked their own paths, regardless of the public opinion or the consequences. Philippe Petit gained fame for his high-wire walk between the Twin Towers of the World Trade in 1974. He performed for 45 minutes, making eight passes along the wire, during which he walked, danced, lay down on the wire, and saluted watchers from a kneeling position. Even the policemen cheered him on. All charges were dismissed in exchange for him doing a performance in Central Park for children. Libra is the sign of relationships. The Moon in Libra is peace-loving and wants to get along with others. It does not like discord. The Libra Moon seeks social approval, and also has a sense of fairness. In the opposing sign, Aries, Uranus and Eris are in a tight conjunction. The exact conjunction took place a week ago, and it was the second of the three conjunctions between Uranus and Eris in 2016 and 2017. Planets in Aries can act impulsively, and both Uranus and Eris are disruptive forces. Rejection and feelings of isolation can be associated with Uranus. A transit of Uranus symbolizes a time, when we need to break out of routines, and let something new in our life. Eris is the dwarf planet which was discovered in 2005, and which astronomically excluded Pluto from the main planets. Eris was named after the Greek goddess of discord. In mythology, Eris was the goddess of strife and discord, who indirectly caused the Trojan War. Because of her tendency to cause trouble, she was the only goddess, which had not been invited to the wedding party of Peleus and Thetis. In a rage she threw a golden apple of discord addressed “To the fairest one” amongst the goddesses, provoking thus a quarrel over who the apple should be given to, which eventually led to the Trojan War. It is time to invite Eris to the party! The new discoveries are not always located far in the icy region of the Kuiper belt. 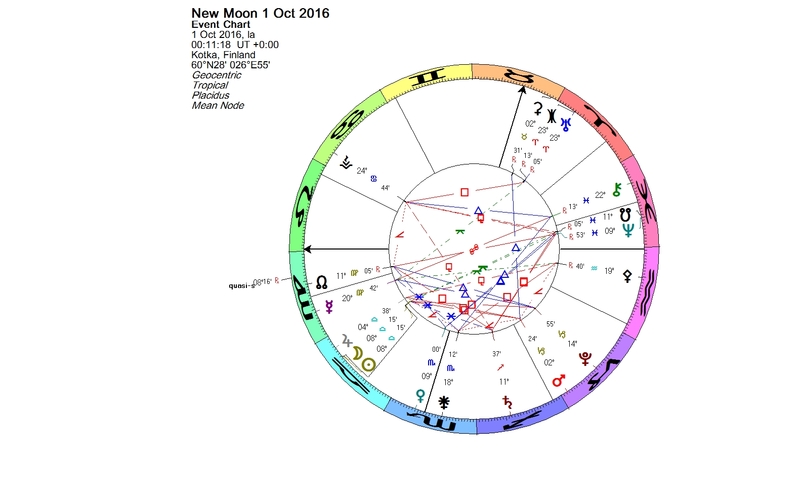 I have included in the New Moon chart a newcomer, which is circulating our own Earth! In the summer solstice chart, 2016 HO3 was in the first degree of Libra, in an exact square to the Sun. At the moment it is at 8+ degrees of Virgo, in a perfect semi-sextile aspect (30 degrees) to the New Moon. Does this new object have any astrological meaning? Generally speaking, a new planet is said to expand our consciousness and open up new possibilities. 2016 HO3 is small and distant, and it is not a moon, but it is our companion, and will be for along time to come. It may be worthwhile to observe its dance. You are currently browsing the Lunations by Kirsti Melto weblog archives for October, 2016.